Obelisk with lamp commemorates the discovery of gold near this site. 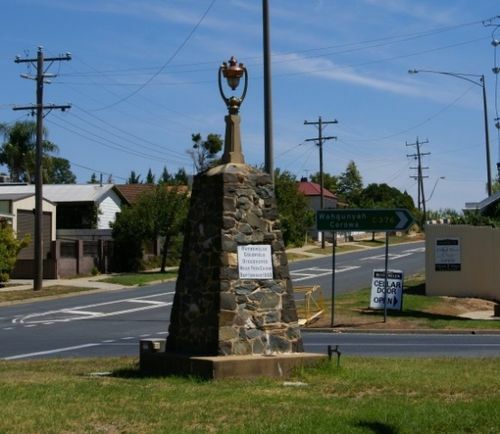 Rutherglen is in the Wahgunyah pastoral run taken up by John Foord in 1841. In 1860 the Wahgunyah Rush township grew among a gold field discovered about ten kilometres to the south-east. A hotel proprietor, John Wallace, brought a hotel building to the goldfield and the growing township was named after his Scottish birthplace, Rutherglen. Within a year it was estimated that the population of the Rutherglen gold diggings was upwards of 10,000. A school was opened opposite Wallace`s Star Hotel in October, 1860, along with Catholic, Presbyterian and Congregational churches. By 1862 the easily won gold was petering out and by 1864 there were fewer than 800 miners. A cairn presented by Cr. R. Ready to Rutherglen citizens to commemorate the discovery of gold in Rutherglen during September, 1860, was unveiled by Cr. W. H. Chambers, president of the shire, on September 28. The site of the cairn is as near as possible to where Messrs. Harry Mitchell, John Mitchell, Thomas Keane and James Keane found gold 70 years ago and received the Government reward of £1000 for the discovery of new goldfields. Dr. Harris, M.L.C., delivered an address. In a cavity was placed a bottle containing a copy of the records of mining in the Rutherglen district and the names of the present shire councillors. Weekly Times (Melbourne), 4 October 1930. Albury Banner & Wodonga Express (Vic), 3 october 1930.